So You Want To Get Into Radio? August, 1945. Atomic bombs fall on Hiroshima and Nagasaki; a prelude to the surrender of the Japanese and the end of World War II. Television stations are broadcasting on a limited basis, but radio is still king. So what's a girl to do but pack up, go to New York and try for a career in radio? It beats making bombs for a living. 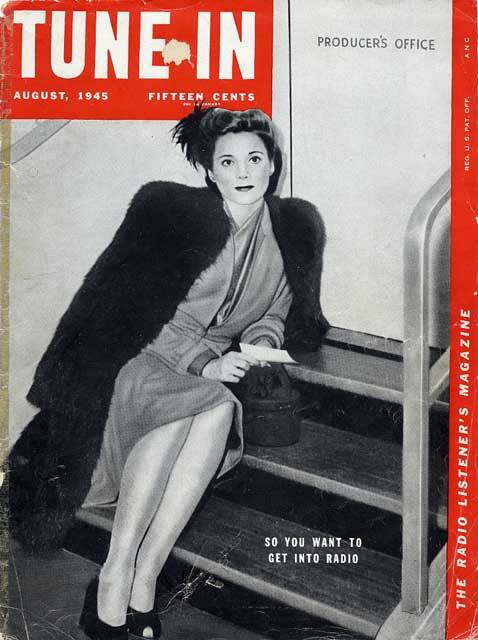 This magazine cover shows a woman waiting outside of the producer's office, gazing into the middle distance like a deer in headlights. No doubt she's wondering if she isn't in for a session on the infamous casting couch. But never fear, this woman gets her job on her talent alone! The article takes great pains to assure the average readers among us that one doesn't need movie star looks or an hour glass figure to get into radio, but judging from the picture it sure doesn't hurt. They freely admit that the woman they've chosen to follow through the process is "a former beauty contest winner...photogenic enough to please the eyes of both the camera man and TUNE IN readers." In other words, you don't have to have legs that would stop a producer dead in his tracks, but it sure doesn't hurt. As the article continues to assure us that looks don't matter, we're told that one of the things we must do as aspiring radio stars is to have postcards with our pictures printed up, to remind the producers that we're out there, looking for work. In the penultimate paragraph we're informed that we had better bring along lots of savings as it takes some time to get that big break. Or you could just marry the sponsor.